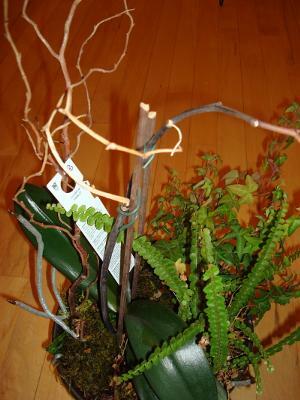 I was given a Phalaenopsis orchid for Valentine's Day 2011. 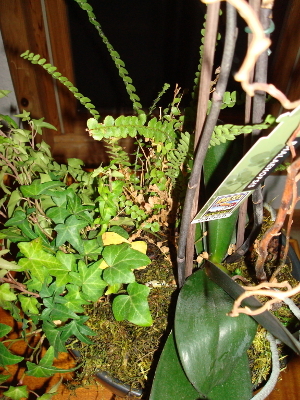 It came from a grocery store floral area, potted with some kind of ivy and a fern. 1. Should I remove the orchid from the other plants? It seems to be doing okay... and everything else is growing, too. 2. 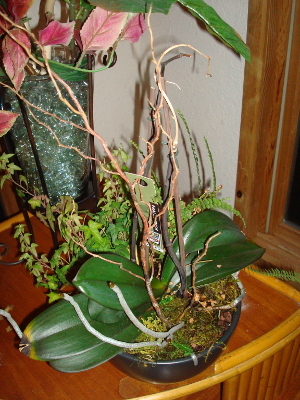 Except that there seems to be an abundance of that I am guessing are aerial roots on the orchid. Thick and healthy in appearance, but can there be too many outside the pot like that? Or are those things supposed to be in the soil? 3. Watering instructions on the tag say to water the plant every 25 days. We're in Wyoming - a high plains desert area, and the house isn't any more humid than it is outside. It is dry and dusty everywhere. Is 25 days correct? (I probably need one of those humidity trays.) I'm thinking the plant(s) need water more often. 4. I've had the plant in a NW window (coolest - except for heat from the fireplace - windy side of the house) since the fall, as I was hoping it might force a bloom over there. When I first got it, it certainly wasn't in direct light, but it was closer to the SE side of the house where it was also warmer and probably drier. It got whatever light that came in from a window about 12 feet away on the SE side, and afternoon light from a window about 24 feet away. But I am wondering if the leaves are too dark. They sure feel healthy, but they aren't as light in color as what I've seen on your website. I'm just not sure where I could put it that wouldn't be in direct sunlight. 5. How will I know if I see a spike where flowers would appear? There are a lot of old, dried up squiggly sticks that I are apparently remnants of old flower spikes. There were flowers on the plant when I got it, but I don't really see anything new (everything looks and feels dry and hard) that might be where flowers would appear (maybe it's too soon, since it isn't February). Do I need to weed out the remnants from the plant? Flowers don't come out on a past stem, do they? There is one stem that is flexible, but the other is not. Maybe some of the squiggly sticks are ornamental? I think that about covers my questions. Hope the photos are adequate. 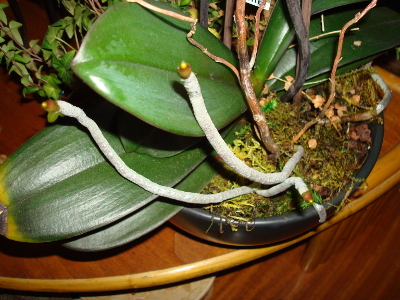 Comments for Can My Phalaenopsis Have Too Many Aerial Roots? I have since moved the orchid plant to the same location where my African violets are blooming like crazy. I read somewhere that, if you have violets doing well, the orchid should do well there, too. The stalks where I *think* there should be flowers still don't show much sign of budding; but they aren't all dried out, so hoping for the best.